MarTech’s Predictive Services provides an extensive range of pdm services for all types of industry to help improve equipment reliability. MarTech has been providing pdm services since 1993 and is continually updating and upgrading our testing equipment to the latest state-of-the-art technology available today and ensure our technicians and specialists have completed all training and certifications the industry requires. Vibration testing and analysis of your plant equipment will give you valuable insight into the operational condition of your plant machinery. By continually monitoring the condition of your rotating equipment we can predict maintenance requirements rather than rely on pre-set time intervals. Electric Motor Testing both online and offline can give you an inside look at motor integrity within your plant. Our PdMA test equipment is designed to monitor and trend the condition of AC induction, synchronous, wound rotor, and DC motors and their circuits. Among the testing capabilities are: power quality, power circuit, stator, rotor, insulation, and air gap. 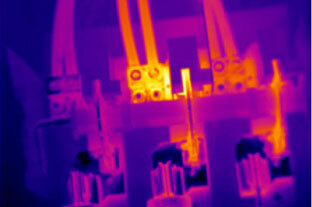 Infrared thermography is a non-destructive, predictive maintenance technique that can be used to monitor the thermal signatures of plant machinery and electrical apparatus and building systems without disrupting normal operations. We also provide corrective actions to address found problems; Laser Alignment. Dynamic Balancing, Bearing Replacement, Machine Base Repair/Build, Machine Overhauls/Repair and Installations.